This scenic 14 mile hike will take you along the beautiful coastal paths and stunning beaches of the Gower Coastline. 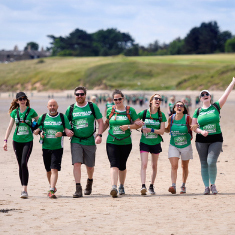 Join Team Macmillan for the 22nd annual Gower Macmarathon which will take you along a beautiful coastal path with stunning views of the Gower Peninsula. From the moment you register to the day itself, you’ll get full support from our friendly team, including a comprehensive fundraising and training pack, sponsor forms, regular e-newsletters and a complimentary Macmillan T-shirt to train in and wear while you walk. On the day, you’ll also receive lots of support from the committee organisers and a team of friendly volunteers, with water stops, medics, and plenty of encouragement along the route. When you reach the finish, you’ll be rewarded with a finisher's medal to say well done and thank you. There'll also be some refreshments and entertainment for you to enjoy. Please note that the minimum age for this event is 18. However, people aged 14 or over can take part with a parent or guardian. The parent or guardian must fill out this parental consent form. When does the Gower Macmarathon take place? The event takes place on Saturday 14th September 2019. Where does it start and finish? The event starts at Port Eynon, SA3 1NN and finishes with a celebration at Mumbles Cricket Club, SA3 4JE. As the event is a linear walk, on the morning of the walk, you may wish to use the car park at Bracelet Bay. This means when you finish the walk at the Mumbles Cricket Club, your car is only a short walk down the hill. If you decide to do this and choose to take the bus out to the Start at Port Eynon, when registering on our website, you MUST select that you require a bus. The bus will take you from Bracelet Bay to the official start at Port Eynon. If after registering you would like a place on the bus you must email the hiking team by Wednesday 14th August 2019 - no additional places can be booked after this date. What time does the hike start? The 14-mile walk will start from Port Eynon at 10.45am so please arrive in plenty of time. The registration desk opens at 10:00am. If you have opted to take the coach from the car park at Bracelet Bay, Mumbles, you will need to be ready to board the coach at 09.30am. Coaches will leave Bracelet Bay promptly at 10.00am. When will the hike finish? How will I know the route? You will be provided with a hard-copy map in your event pack which should be with you in August. You must bring this with you on the day but the route will be fully marked and marshalled. Please note the latest you should leave Oxwich water station to cross the rocks in front of Great Tor safely is 1.15pm, otherwise you risk being cut off by the tide. If this happens Walk Marshalls will not be able to allow you to cross the bay. An alternative, longer, more difficult route would need to be followed which would take more time. Can someone walk with me who is not a fundraiser? We’re afraid not. The aim of the event is to raise as much money as possible for people affected by cancer so everyone who walks on the day will need to pay the £20 registration fee and raise the fundraising requirement of £125. We hope to have a team of 1200 people taking part. This is the maximum number allowed to walk on the day so please register as soon as possible to secure your place. The minimum age for the event is 18. However, teenagers aged 14 and over can take part if they are accompanied by an adult and a parental consent form is completed. They will still need to pay the £20 registration fee and meet the minimum fundraising amount of £125. Yes, you can bring your dog but they must be well behaved and on a lead at all times. Car parking is available near the Finish at Bracelet Bay (see above). There are also some spaces at Mumbles Cricket Club for family members and supporters who may wish to welcome friends and relatives at the Finish, from approximately 2:30pm onwards. PLEASE NOTE: transportation back to Port Eynon is not provided at the end of the day. We recommend that walkers select to make use of the buses provided or arrange to be dropped off at Start at Port Eynon by family/friends. We do NOT recommend that you drive to the Start and leave your car at Port Eynon. If you choose to do this, it is your responsibility to collect your car from Port Eynon at the end of the event. Bottled water will be available free of charge along the route however we recommend you bring at least 2-3 litres of water with you. There will be no food provided so you should bring a packed lunch and snacks or money to purchase food at the various cafes and refreshment establishments along the route. At the Finish you will be able to purchase hot food and the bar will be open at Mumbles Cricket Club. The challenge is a long, sustained walking challenge and therefore requires a good level of fitness. Whilst within the capability of anyone who walks regularly, it should not be underestimated. You can download a comprehensive training guide to help you prepare. Is there somewhere I can leave my bags? No, there is no baggage drop facility so you should plan to carry everything you will need for the day. What happens if I fall ill or get injured on the event? On the day you will be given an emergency number to contact should you need any assistance whilst on the challenge. Medical services will be available on the day. There will also be a marshal following the last walker on each 3-6 mile stretch to ensure everyone completes the section safely. The event is conceived and operated by the Swansea Macmillan Voluntary Committee. It is covered by Macmillan Cancer Support’s Public Liability Insurance. What happens if I don’t raise the £125 minimum fundraising amount? As for any charity, organising events costs money. 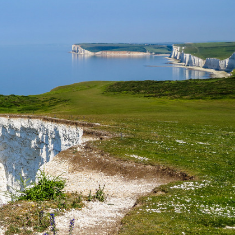 The registration fee of £20 does not cover all the costs of putting on a hiking event of this scale, so we have to set a minimum fundraising amount. This ensures that Macmillan’s costs are covered whilst ensuring the majority of fundraised money is spent on supporting people with cancer to help them live life as fully as they can. This is, of course, the main aim of the Gower Macmarathon. We ask that the £125 is with Macmillan one month after the event. If you have not reached £125 by this time you will receive emails from us reminding you of your pledge. It’s really important that everyone raises the full £125 so that we can invest the total funds raised from this event to help people living cancer. However, please don’t be daunted, last year our fantastic Gower Macmarathon hikers raised an average of £252 each so you may surprise yourself with what you’re able to achieve! The money raised at the Gower Macmarathon enables Macmillan Cancer Support to provide specialist cancer services to local people. • We are the nurses and therapists helping you through treatment. • The experts on the end of the phone. • The advisors telling you which benefits you’re entitled to. • The volunteers giving you a hand with everyday things. • The campaigners improving cancer care. • And with your help, we are the fundraisers who make it all happen. Does Macmillan help me fundraise? About two weeks after you sign up you will receive a Fundraising Pack in the post with training tips and fundraising ideas. You can also download a comprehensive Fundraising Guide to help you, together with a Sponsor Form and other tools to help boost your total. We’ll be in touch with helpful newsletters and are on the end of the phone if you need assistance. How do I set up a JustGiving page? JustGiving is the quickest and easiest way to start your fundraising. Simply follow this link to set up your page. I’m doing the event with my friends or family. Can we have the same JustGiving page? Of course! But we do ask that you let us know if you are fundraising jointly with other people so we can update our records. Once you’ve set your JustGiving page up, drop us an email and let us know the link to your page and the names of all the people fundraising on it. How can I get another sponsor form? Download a sponsor form here or if you don’t have a printer, request a hard copy by email. How do I get hold of Macmillan banners & balloons for my fundraising event? Just email us and we’ll send you fundraising materials to help you with your fundraising event, including: Macmillan bunting, banners, balloons, poster and leaflets. How do I get hold of a collection tin or bucket? Download and complete this request form and send it back to us. Don’t forget it takes two weeks for your tin or bucket to arrive so send in your order in plenty of time. My company is going to match my fundraising? What do I need to do? Once you know your matched-funding application has been approved, please contact us. We’ll need to know how your company will be sending the funds to us, on what date and how much. How do I pay my sponsorship in? o By Post - send a cheque made payable to Macmillan Cancer Support and addressed to Macmillan Cancer Support to 89 Albert Embankment, London, SE1 7UQ. Please complete a Postal Payment Slip or write a short note stating your name, address and amount sent. Always quote GO2019 – Gower Macmarathon 2019 14 miles on any correspondence. o At a NatWest or RBS branch - email us for a bank giro credit slip to use at your local branch. Please mark it Gower Macmarathon 2019 14 miles. o By Phone - call us on 0300 1000 200 to pay by credit or debit card. o By Bank Transfer - email us for your unique reference and our bank details. This is a long walk in Wales so you should be prepared for all weathers! We recommend you wear layered clothing, comfortable footwear (walking shoes/boots recommended) and bring waterproofs, hat, gloves etc to protect you from the cold and wet. You will also need a rucksack to carry everything needed throughout the day (camera, water, snacks, waterproofs etc). We also recommend you bring a pair of flip flops with you for when you walk across the sand. This will ensure that you do not get very wet feet/socks! In previous years, some of our participants have decided to wade through the streams of Oxwich Bay and Three Cliffs, so please bring a spare pair of socks. Should I wear walking boots or trainers? This is a personal preference but we recommend walking boots as they will give you better ankle and foot support. We recommend that you don’t walk in brand new boots on the day of the event, so please take some time to wear them on training walks. The t-shirt you sent me doesn’t fit. How can I get another one? Can I use walking poles? Yes. We recommend you train with them beforehand to ensure you are used to hiking with them. Simply sign up online and pay the registration fee of £20. You will then need to raise a minimum of £125. Please ensure this is with us one month after the event (14 October 2019). I can’t get the online form to work. What can I do? We’re sorry you’re having difficulties with the online form. This is sometimes due to the Internet Browser you are using so it’s worth trying another browser if you can. Otherwise, complete this offline form or call 0300 1000 200. I’d like to do the event with family or friends. Can we sign up as a group/team? We’re afraid not. You will all need to sign up individually. If you are taking part with other people you are required to raise £125 each but you can do this together. Please use the registration form to let us know you are taking part with others and fundraising together. Registration will close one month before the event, on 14 August 2019 (or as soon as we reach 1200 walkers). After this date, we cannot accept any new registrations or transfers. I can no longer do the event. What do I need to do? Please email us as soon as you know you can’t take part. Can I transfer to the 22-mile event? Yes. However please email us to let us know that you would like to transfer. Please note that you cannot change your distance after 14th August 2019. Yes. Just email us to let us know the details of who is taking your place. We will then need them to complete an offline registration form. Please email us for an offline form. Unless this is completed and returned, they will not be able take part. Please note that you cannot transfer places within four weeks of the event taking place. For health and safety reasons it is really important that you tell us if someone else is taking your place. Can I get a refund of my registration fee if I cancel? We’re afraid not. The registration fee is non-refundable under any circumstances. Can I defer my place to next year? Yes. Just email us to let us know. Please note that you cannot defer your place within four weeks of the event taking place.